The actual taco. Bon appetite. Some people taking going green a bit too literally and that's just fine with others. 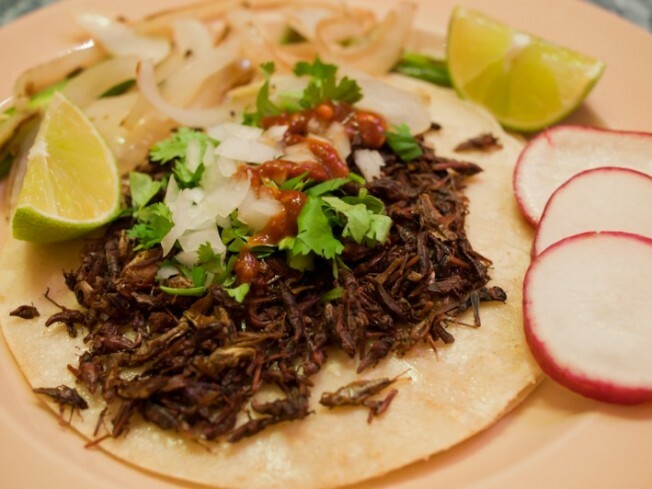 La Oaxaqueña Bakery and Restaurant in San Francisco's Mission district is serving up grasshopper tacos. There is no play on words, the restaurant is literally frying up the little hoppers, throwing some lime and chili on them and rolling them out on a soft shell taco. The folks at SFist have worked up the courage to try them out and equate them to eating popcorn and report that the tacos are actually "quite popular" and "people are willing to try them." The grasshopper tacos are a highlight -- a wondrous, homage to sustainable eating. Crispy and spiced to keep the rounds of water coming, these tacos are a light and wholesome meal that double in making you feel like a badass. The only downside: the owners import their grasshoppers from Mexico, which may leave finicky foodies longing for locally sourced bugs. If you want to try them out for yourself, La Oaxaqueña Bakery and Restaurant is located at 2128 Mission St. in San Francisco.